It's been a busy couple of weeks around here, yet it still feels like we have accomplished very little. Our house certainly looks like we haven't been keeping up on the cleaning. Oh, the vacuuming, dishes, laundry, and bathrooms have been kept up (mostly), but there is no way the house is at our usual standards. And please don't swipe your finger across any surfaces, you'll disturb our evenly distributed dust. What exactly have we been doing? Many, many doctor visits for all members of our family, and keeping up our previous home which is (thankfully) tenant free and for sale. On an extremely positive note, my husband Fred has been declared "cured" of his pheochromocytoma by the team of endocrinologists overseeing his care. It will be one year on Mother's day (May 12th) since he fell ill. Last year, right about this time, we were anticipating Amber's dance recital with no clue how life changing it would truly be. After suffering a massive coronary that started during Amber's dance recital and progressed to kidney failure, respiratory failure, heart failure, liver failure, and oxygen deprivation my husband slipped into a coma in the wee hours of Mother day. Now, one year later, Fred is fully restored to health with no detectable effects from his ordeal. As the attending endocrinologist said "You dodged a pheochromocytoma, and now have to deal with the normal effects of aging like the rest of us." Fred does still have genetic testing to complete this summer, to ensure the pheo was not the beginning of a nasty disease. However, it appears unlikely. On our way to yet another appointment. 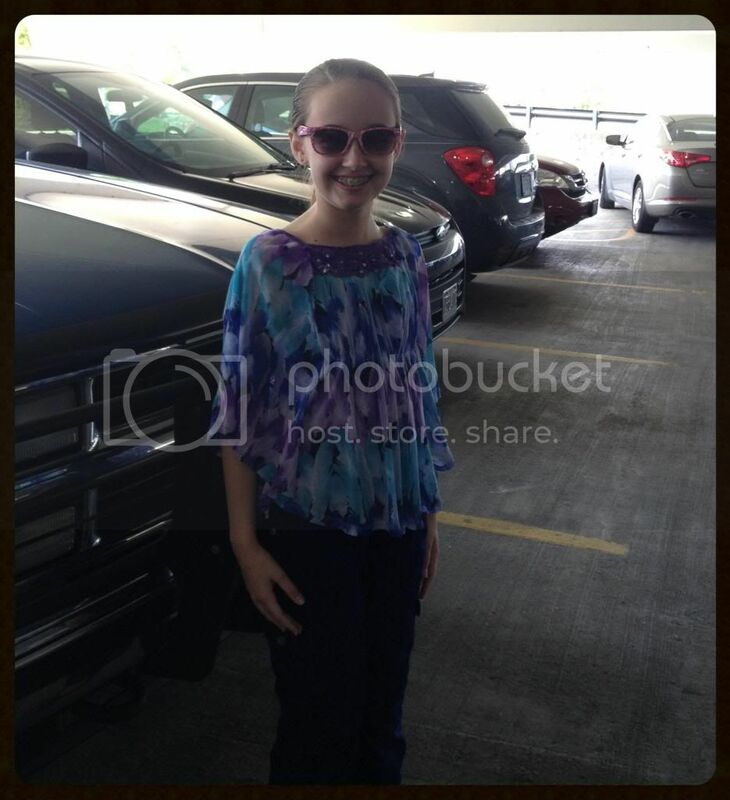 But she wore sunglasses for the first time in years. No more transitions glasses. Amber and I have been going to doctors' appointments for the two of us as well. We still don't know why Amber is having such tummy and intestinal troubles, but her GI doctor and mine are working together now. It appears the progressive mystery illness that I've had for years, which was dumped into the general bucket of IBS (Irritable Bowel Syndrome), might be something genetic. Amber has additional symptoms making her quite similar to the early progression of my symptoms. I hope between the two doctors they can decide what we have, because I don't want Amber to have the rapidly degrading quality of life I've had for the past 4 years. Amber is on two new medications to heal the damage already done to her stomach. I hope it helps her, but one of those medications didn't work for me in the past. Amber also had more tests run this week and we await the results. I am on one new medication (same as one of Amber's), and I have an impressive array of blood tests scheduled for Monday along with an ultrasound. There are definitely a few of those tests that I would really like to see come back negative, Crohn's being one of them. Crummy in the tummy, but has a kitty buddy. Ironically, during the past few weeks we began 6th grade Biology in science, and it has not exactly been a spectacular start. This is no fault of the curriculum which we actually do like, in theory. It's the topic that is the problem. Amber has found that she is more disturbed by biological images and topics than she originally thought. We are using Elemental Science's Biology for the Logic Stage. Amber has no problem with the definitions, timeline work, reading the text and note taking, or even some of the experiments. Unfortunately, the images in the books and the weekly sketches are causing some definite issues. Just looking at the pictures of cells, and having to label the parts, was too much for Amber. In her words, the images of the cells in the Encyclopedia of Nature were "wrong looking and too organic to see". Then, I had her try one of the other recommended spine books, The Usborne Science Encyclopedia. Let's just say that their graphics would normally be considered better than the Encyclopedia of Nature. In our situation, this was not a bonus. I'm at a loss as to what to do for the problem, because in all honestly, I feel exactly like Amber and have no desire at all to look at anything organic or biological. There was a reason I went into physics and computer science. We are attempting to forge ahead in biology, but will probably end up doing more of an overview instead of the planned course of study. 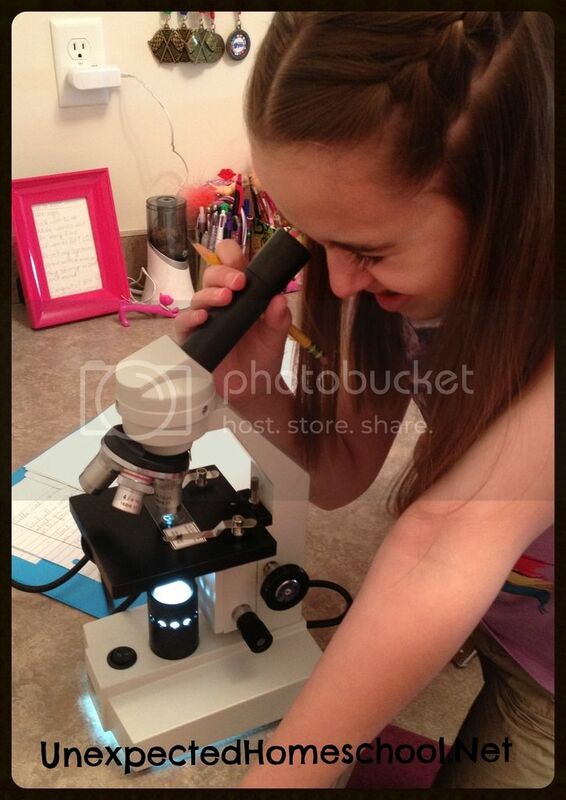 The microscope was a big hit, especially since she doesn't have to deal with glasses anymore. 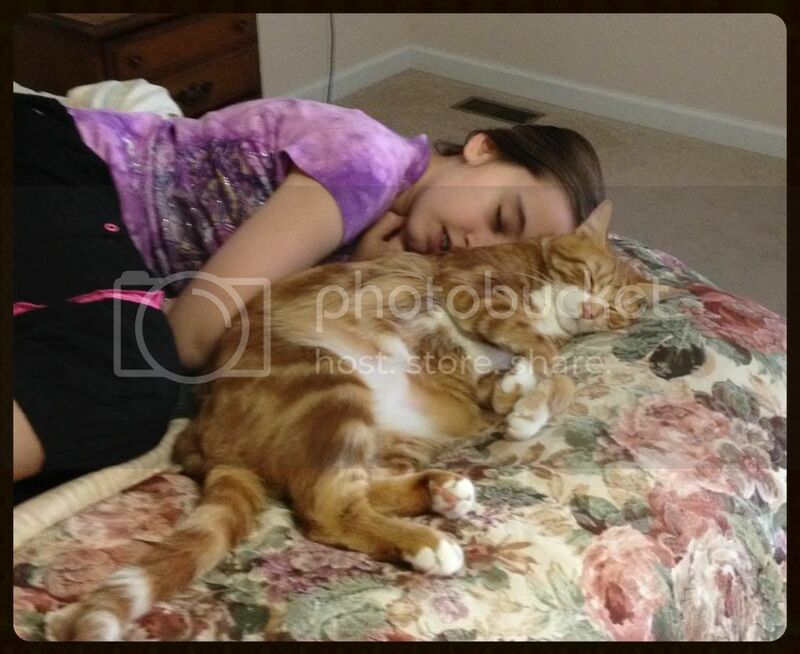 Amber has been plugging along in the rest of her subjects and is nearing the end of 5th grade. She has 10 lessons left in Saxon Math 7/6. Given her scores to date, and the recommendations given by Art Reed in his newsletters, I am almost certain that Amber will proceed to Algebra 1/2 next year. 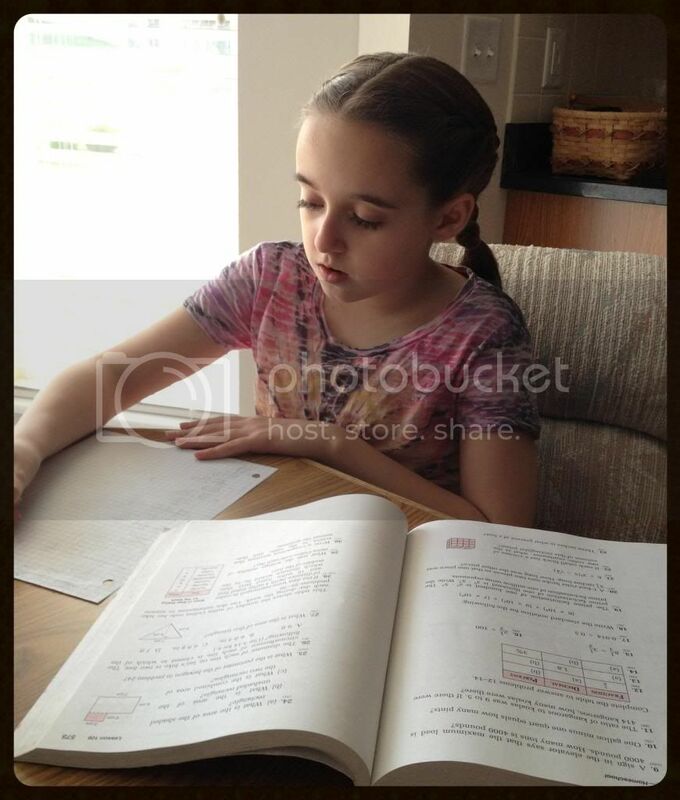 It is daunting to have a 6th grader in Algebra 1/2, however Amber is actually quite gifted mathematically. We will simply have to let her guide the speed at which we complete Algebra 1/2. Grammar, Social Studies, Literature, Spelling, and Writing are all on target to finish on or before May 31st. Thankfully. Latin will continue through the summer, alternating days with Biology. We have never given up school completely over the summers, even when Amber was in parochial school. While we don't have a set summer school schedule, we do try to work on something each day. But some times you just gotta have a lazy, goof off, forget about everything except fun day. We have also followed Amber's interest to study the musical Phantom of the Opera, but don't tell Amber because she doesn't realize she's learning. Amber has been practicing "Angel of Music" for her piano recital in June, but she didn't really understand the song and that affected her playing. I chose this song for Amber to play in recital as a gift for her dad. He has LOVED Phantom of the Opera for almost as long as I have known him and now he is able to share this interest with Amber. Amber and I have been discussing the plot and listening to the soundtrack (with Michael Crawford). It took quite a bit more discussing than I planned, though. I ended up having to explain the role of opera in France at the time of the story, as well as the social structure. Amber has so many questions about historic time periods that it is easy to get side tracked. Still, it has been a fun learning experience and Amber's musicality on the piece has improved. This weekend we are going to watch a couple of video / movie versions of Phantom, so that Amber can see the musical, besides just hearing it. 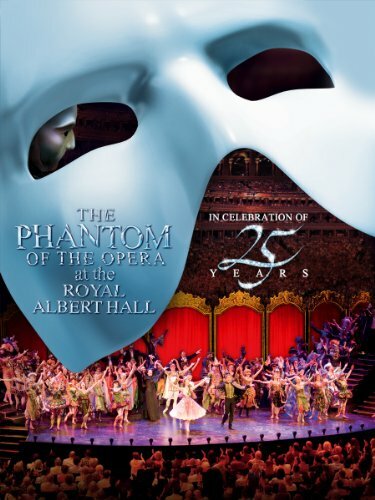 The first is the 25th anniversary celebration of Phantom of the Opera at the Royal Albert Hall. Unfortunately, Sarah Brightman and Michael Crawford only make appearances, but it still is a great version to watch. We are also going to watch the 2005 movie version staring Gerard Butler. I've heard it's not as bad as I might expect, so we will give it a try. That is our past two weeks in a nutshell. Happy Mother's Day to all the moms out there and I hope everyone has a relaxing weekend. It does sound like a busy couple of weeks! I hope you get some good answers with the medical tests. Thanks for joining us at Friendship Friday! I missed you last week! Sounds like Biology is a bit of a problem. Is there any other way of studying it that's not so aversive to you guys? My girls went through an, "I love the Phantom" stage a few years ago! We've seen the Gerard Butler movie version of the story and then they fell in love with him too! LOL!! My oldest son and his wife live in NYC and took them to see it on Broadway. It was long phase, but they've moved on to other things! I pray that the two doctors will figure out what is going on with both of you. What a hard thing to deal with. What a blessing your husband is ok. I hope you all have a wonderful weekend. Happy Mother's day. I'll pray that you get some answers from the tests and for a simple solution. I was tested a couple of years back for celiac after having friends diagnosed and recognizing the symptoms in myself. Fortunately that came back negative but I don't think they tested for anything else. It something I have gotten used and I know certain food that set me off and avoid those. Of course that also means I sometimes treat myself knowing the price I will pay later. I am so glad that Fred has been 'cured'. That is wonderful news. I hope you and Amber will soon be feeling wonderful! Sounds like everything is going wonderfully besides Biology. I hope you find a way to 'work around' Amber's problems and if not..there is plenty more to learn! We love Phantom also. It is great that Amber is so great at Math. It is Keilee's least favorite subject. :/ Happy weekend Christy and have a wonderful Mother's Day. I adore the Phantom of the Opera - when I saw it live three years ago I cried during the opening organ parts. It was so emotional, because I had wanted to see this musical for so long and just love the music. I am very impressed that Amber is doing so well in Saxon 7/6. Anna has about 8 lessons to finish the text and it's getting tedious near the end. I will be praying for ALL OF YOU... you have so much on your plate with all of your health questions and concerns. I will pray for wisdom, peace, and HEALING. I appreciate you always linking with Collage Friday - I learn a lot from reading about what you do with Amber! Mary, Fred and I saw Phantom in St. Louis many years ago. It was spectacular. I hope that we will be able to do the same thing for Amber soon. We're supposed to dust?? Huh. Well, even without crazy, insane days I never do seem to get to dusting...or the cobwebs in the corners of the ceilings. LOL I say - NO WORRIES! Wowzers on your husband! He's come so very, very far! Now - answers for you and Amber! What about dropping Biology and doing something else? Perhaps she'll feel more comfortable with it in another year? I just finished reading The Maker's Diet, and I thought it was fascinating. Have you read it? The author suffered from severe stomach and intestinal problems for years that the doctor's just couldn't resolve, but he was cured with drastic diet changes.